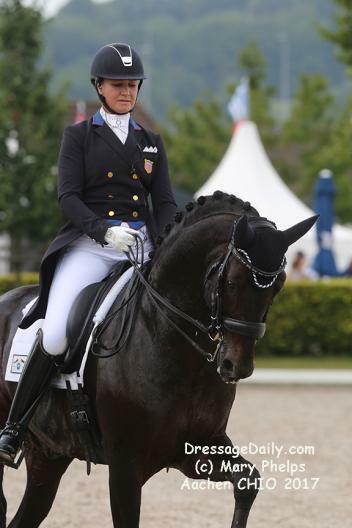 The US Dressage Team continues to show their international prowess as demonstrated at Aachen CHIO finishing second in the first leg of the Lambertz Nations Cup. 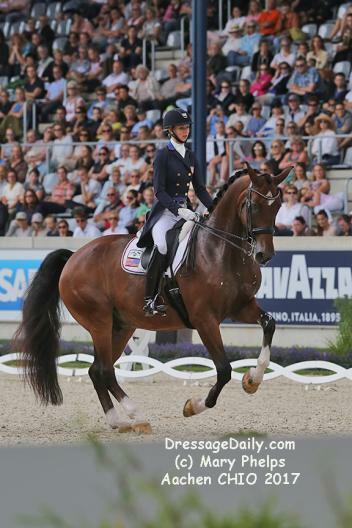 A selection trial for the European Championships European riders are fighting hard to be selected, while the US continues to do their international homework growing stronger in depth and talent. Sending in their A Team, Germany dominated with her World Cup Champion and Olympic Silver Medal mare Weihegold ( OLD Don Schufro X Sandro Hit) the only ride to crack the magic 80% with an 83.171. 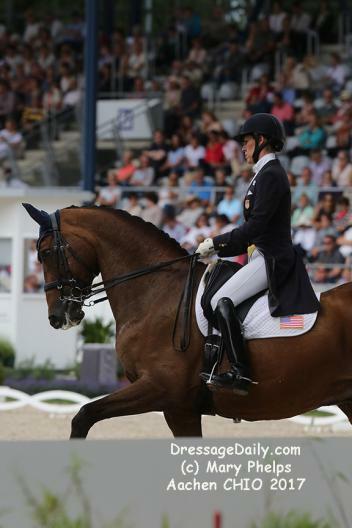 USA had their big girl britches on, with Laura Graves and Verdades, Adrienne Lyle and Salvino, Olivia LaGoy Weltz and Lonoir, and Kasey Perry-Glass and Dublet. Only Graves and Lyle have been in the impressive sold out stadium, and not since 2014. Lyle and her newer mount Salvino (HANN Sandro Hit X Donnerhall) set the stage scoring an impressive 71.814 drawing smiles and applause, with the radio commentator declaring them a “force for the future”. Olympian Kasey Perry-Glass and Dublet (DWB Diamond Hit X Ferro) launched into a powerful test laying down impressive marks until the first pirouette. She was not quite prepared, and Doublet misunderstood her cue. While they actually went to the left, the movement scored a 0 after a quick judges’ conference at the end of her ride, but it was not an error of course which would have been more costly. Perry-Glass rallied immediately without missing a beat. “I knew I better get to work and make up for that one, ” she admitted. Riding bravely and with great focus she still managed to keep up her average to a 68.929. Kasey said there was a moment as she entered the arena she realized what she was in for. With a full house of knowledgable spectators, even the slightest misstep is expressed in unison with oohs and ahhs. But the crowd loved her as she left the ring smiling and praising her horse, her soulmate and friend. 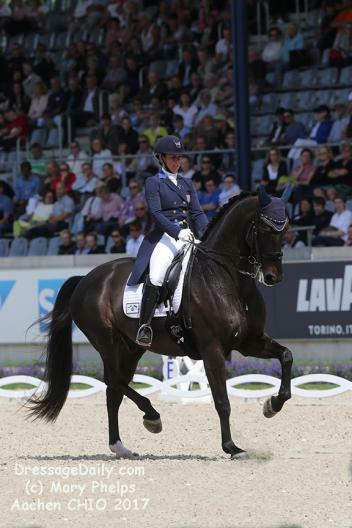 Coming off a Nations Cup Team Victory at Rotterdam, and third place finish in the Grand Prix, Olivia Lagoy-Weltz and Lonoir (DWB de Noir X Loran) were focussed and cool. Following some strong performances by Germany, Denmark and Spain, Lagoy-Weltz knew their ride was needed to up the average where a Nations Cup victory for the other European competitors meant a team selection. A result of 71.5 was in the ballpark. But in going for it there is a fine line and a mistake in the two tempis kept her from the magic mark in spite of 4 of the seven judges scoring her over 80, with one having her first. Her result a 79.514 and second place, again, to Isabell kept the US Team in second, with the final and deciding round to be held Saturday, July 22, in the Grand Prix Special. This entry was posted in FEI & USEF Dressage News, News and Announcements, South Florida News on July 21, 2017 by ludlumfarms.